Efficiency Works offers rebates that can help increase your home’s efficiency in order to save energy, water and money. An efficiency adviser can help schedule a home efficiency assessment, after the assessment your advisor can help with finding a qualified Efficiency Works service provider to perform your home improvements. Financing opportunities for efficiency improvements may be available through your electric utility. The average home owner in Northern Colorado spends over 5% of their monthly budget on utility costs. Efficiency Works wants to help bring that percentage down. With rebates for qualified furnace and/or air conditioning replacement, insulation, windows and much more Efficiency Works can help your home use less energy, in turn saving you money. Renewable energy is energy generated from a source that cannot be depleted - such as wind, solar or hydropower. Energy efficiency is the practice of using less energy. Efficiency Works purpose is to help homes and businesses become as efficient as possible. Reducing the amount of air that leaks from your home. By air sealing your home you reduce the air that escapes, saving energy used to heat or cool your home. Caulking and weatherstripping are two techniques that are generally used for air sealing. Air sealing is most effective when combined with the proper insulation. Reducing the amount of air that leaks from your ductwork. A material is applied to connections within ductwork to minimize the air that escapes. A device that adds water to outside air, cooling the air by evaporation. Also known as a swamp cooler. Seasonal energy efficiency ratio (SEER) and Energy Efficiency Ratio (EER) are how air conditioning systems and heat pumps have their efficiency measured. The higher the SEER and EER the more efficient the unit is. A method of cooling the home using fans and outside air, drawing in outside air when it is cool and turning off during the heat of the day. System that pulls air from open windows and exhausts it through the attic and roof. An alternative to furnaces and air conditioners. Uses electricity to move heat from a cool space to a warm space, making the cool space cooler and the warm space warmer. The most common heat pump (air-source) transfers heat between a house and the outside air. Window replacement using an Efficiency Works listed service provider is more than just pulling out your old window and replacing it with a new one. Window installers are required to air seal around the existing window frame – which requires the removal of interior and exterior trim. 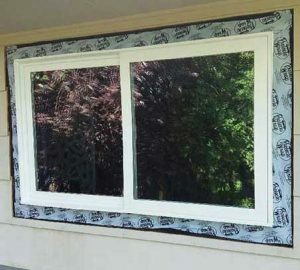 This additional step will ensure that there are no leaks around your window, allowing the replacement to be even more energy efficient for your home. A measurement of an insulation material’s thermal resistance. Higher R-value means the more effective the insulation will be. Proper installation is key to retain the R-value – compressed insulation will not provide its full R-value. Test to ensure the safe operation of combustion gas-powered appliances (i.e. furnace, boiler, water heater) at a rated efficiency. A measurement of heat loss. The lower the U-factor, the greater the window’s resistance to heat flow – therefore having better insulation properties. ENERGY STAR® provides recommendations for the appropriate U-factor for what climate you live in.